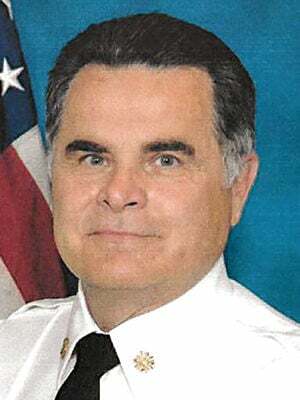 Crestwood’s former Fire Chief Karl Kestler died suddenly on April 5. He had a 38-year career in the Crestwood Fire Department, and twice was appointed as acting city administrator during his tenure. Chief Kestler, 67, served as Crestwood’s fire chief from 1997 through Jan. 2, 2012, when he retired. Chief Kestler spoke previously about his first call as a Crestwood Fire Department firefighter. It was in 1975 at the Heather Apartments off Watson Road, on an assist to the Affton Fire Protection District. He recalled that firefighters could barely get trucks out on Watson Road due to backed-up traffic going to Crestwood Plaza for Christmas shopping. Chief Kestler was known as a firefighter leader who also looked out for Crestwood homeowners’ insurance premiums. In 2007, he noticed what he thought were errors made to the city’s Public Protection Classification. The astute chief was right. The difference in Crestwood’s insurance ratings in question could have cost the city’s homeowners an additional $100 a year in insurance premiums. Chief Kestler attended Cleveland High School in St. Louis where he played football, baseball and soccer. He also played soccer and baseball at St. Louis Community College at Meramec before graduating from Maryville University. His favorite pastimes were muzzleloading, weightlifting, cheering on the St. Louis Cardinals, and biking or traveling with his wife. Memorial donations may be made in Kestler’s name to the Siteman Cancer Center, 4921 Parkview Place, St. Louis, Missouri 63110. Mabie said Crestwood firefighters and city officials were grateful to Webster Groves and Kirkwood Fire Department firefighters for covering Crestwood community fire duties on April 9 so they could attend the chief’s funeral.